Ex Machina (2015) is the far less hyped of the two films currently doing the rounds about looming artificial intelligence. But what it lacks in hype, it makes up for in smarts and is a much more satisfying and thought provoking experience than Avengers: Age of Ultron (2015). Less explosions and witty banter though. The film is the directorial debut of accomplished novelist and screenwriter Alex Garland, he of 28 Days Later (2002), Sunshine (2007) and Dredd (2012) fame. It sees timid boffin Caleb (Domhnall Gleeson) visiting the palatial home of the owner of the company he works for Nathan (Oscar Isaacs). Caleb is there to help the exceptionally clever and calculating Nathan test the proficiency of a new form of A.I. that he has developed. You can possibly hazard a guess at the intrigue that is to follow, thought that is not to say that it is predictable. There is a familiarity to it all coupled with an edge of intrigue as you can sense that perhaps you are not totally all over where this is headed. Garland’s script is chiefly responsible for this and it’s a very clever piece of work. There is a denseness to the scientific language that never feels too oblique or conversely jokey in its use of jargon. The script smartly guides the action and feels at times like a tightly crafted mystery almost rather than a sci-fi script. Its relatively talky, as most of the plot and themes come out in the conversations between Caleb and the feminine A.I. Ava. This includes the exploration of Ava as a sexual being, Caleb’s interest in that side of her as well as her fear of ‘death’. Interesting to see that last rather specific theme reappear so soon after Chappie (2015), which I thought (probably in the minority here), explored that pretty interestingly. 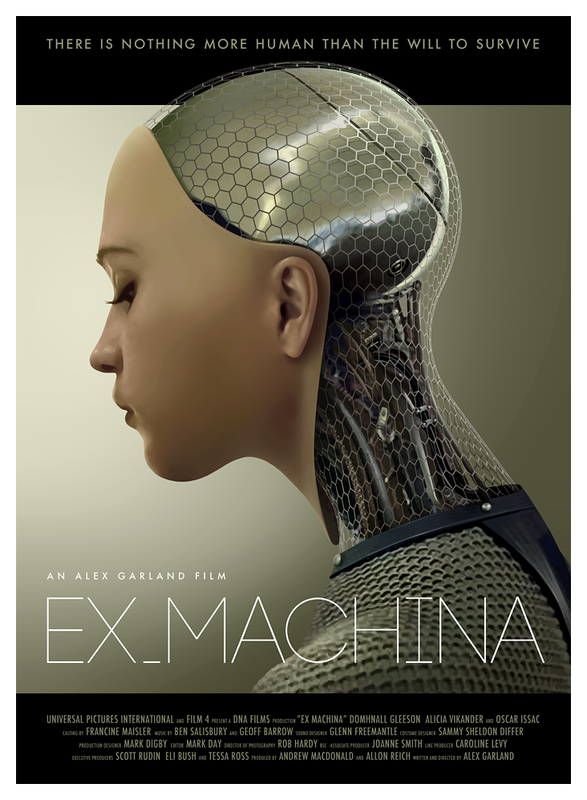 For a film by a first time director such as Garland, Ex Machina is remarkably assured. Perhaps it helps that he has been around sets so often and worked with so many maestros. It probably also helps that he wrote himself a darn good script. Despite the slow pace, there is an economy to the storytelling in the film. The first scene rapidly establishes the backstory to the film and quickly whisks the viewer off to the expansive ice covered and lush greenness of Nathan’s property. This economy never really leaves the film, with non-disclosure agreements, small chips in glass panels and much more conveying so much of the exposition that in the hands of a lesser filmmaker would be in the form of throwaway dialogue. Even the construction of the story is pretty bare bones. Alicia Vikander, as the A.I. Ava, joins Isaacs and Gleeson as the only three really key players in this story. Vikander is exceptional too, nailing that so close to human but not quite vibe that is so intrinsic to her character and the themes of the film. All three of the central performances are very good, Isaacs makes you believe in the brash, arrogant genius of Nathan whilst Gleeson, after initially overplaying the awkward overwhelmed geek aspect of Caleb, makes you really believe in the interactions between him and Ava. To see three skilled performers and have so much of the film’s success, both in terms of themes and buying into the plot, dependent on their skill is part of what makes Ex Machina so satisfying. Related beermovie.net articles for you to check out: Avengers: Age of Ultron and CIFF 2014: The Congress. I’ve heard nothing but great things about this. Can’t wait to see it. Garland should direct a Dredd sequel! This sounds really good. I may not be able to catch this in the theaters but hope it comes to ‘on demand’ soon enough. Yeah mate. It is definitely worth a look if you are into taut, intelligent sci-fi. Garland is a top writer. Dude. That is an absolutely killer poster. And a great review to go along with it. Glad you liked this man, it’s up there with my favorites this year. Everyone is raving about this! I NEED to see it. Big fan of Isaac and Gleeson, too.